We are heading to three (yes 3!) Polar Express Trains this year. Our first will be at the Blackstone Valley Polar Express in Woonsocket, Rhode Island. I have heard such great things about this experience. 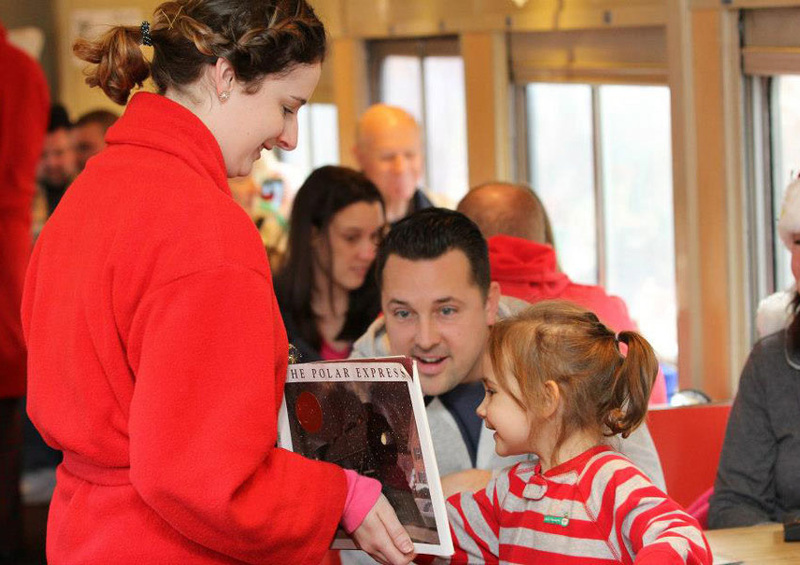 For the past 15 years The Blackstone Valley Polar Express has been taking pride in every detail of their train ride – from the decorated historic train depot to the style of cups used for their hot chocolate. We are really looking forward to kicking off our Holiday season with Blackstone Valley Polar Express! 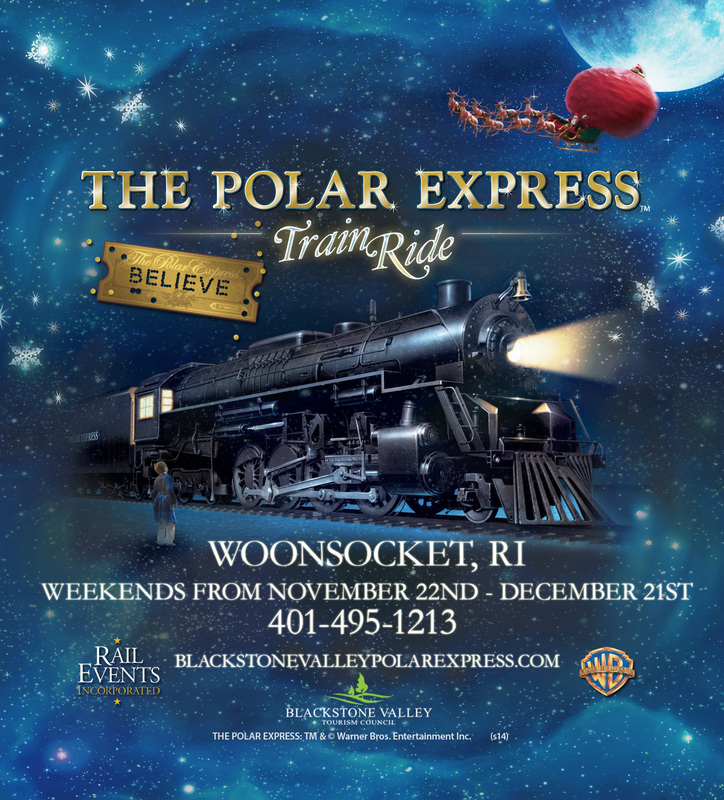 The Blackstone Valley Polar Express trips leave from the Historic Woonsocket Depot on weekends from November 22nd to December 21st. Your experience begins the second you enter the depot where there are festive decorations in a holiday atmosphere. There is music playing and many opportunities for photos with the characters of The Polar Express in the depot. Once on the train, The Polar Express book is brought to life. The classic story is told, holiday songs are sung, and delicious hot chocolate and cookies are served. Santa also makes a special appearance to give every child a special gift. Santa also joins everyone back at the depot for photos and to hear children’s Christmas lists. Children will also receive collector’s edition Polar Express coloring books featuring the characters seen in Woonsocket. Tickets are available at blackstonevalleypolarexpress.com or by calling 401-495-1213. Tickets are becoming very limited, so get your tickets today! Three?!?!? We wanted to take our little boy but tickets are outrageously expensive. Have fun. We are doing this this year as well! LOVE LOVE LOVE it!! I will be posting different events almost everyday leading up to the Holidays! If you follow the blog via email, you will get each post featuring a new place as I post them 🙂 Where will you be visiting from? How fun! I wish we had something like this closer to where I live! Looks fun! We always have a Polar Express party at our house. I love the magic of the holidays! This sounds like such an amazing adventure! I wish they had this closer to us, I know a few people who would love it! This is so sweet! It reminds me of the Polar Express day when I was teaching kindergarten! The students loved it! What a fun and festive memory! This sounds like so much fun. I wish they has something like this here. I’m taking the kids to Woonsocket Polar Express for the first time this weekend. I’m so excited. Any thoughts on whether I should dress kids in pajamas for the adventure or dress them up for picture opportunities with Santa? Wondering what most people do for this? Any advice would be appreciated. I had the same thoughts! I’m not sure if I should have Owen in his PJ’s or a cute outfit for Santa photos. I think for our train this weekend I will do a cute outfit since its at 1:00. But our next train at Edaville is at night so I will do PJ’s.